This was a comment made by the Brits sitting next to us in the Iglesia de la Encarnacion in Marbella, where we had just witnessed the most memorable performances of Mozart’s Requiem. He went on to mention that they had just returned from Saltzburg where they had attended many concerts but this topped them all. no one could remember an audience of this size in the church, indeed, “they were standing in the aisle”. As a measure of their appreciation, those present gave a standing ovation for over five minutes, such that Annemarie Philipps (musical director) had to give an encore to satisfy them. 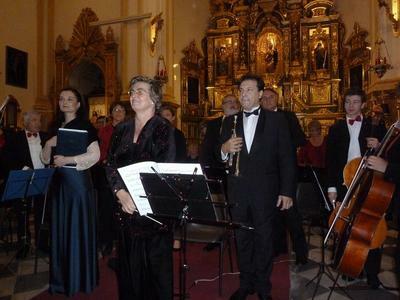 The performance was given by the COLLEGIUM MUSICUM Costa del sol and CAMERATA SINGERS of Sotogrande under the ‘Magical’ direction of Annemarie Philipps, celebrating her twentieth anniversary with the orchestra. Although they classify themselves as ‘amateurs’, rarely would you find a more professional rendering of this wonderful work. Esmeralda Espinosa, soprano, Maria Rosas Perez Diaz, mezzo, Luis M. Pacetti, tenor, and Damian del Castillo, baritone. The Requiem was preceded by an equally delightful performance of the allegro from Mozart’s Clarinet Concerto K622 by the soloist Juan Crisostomo Subiea. If ever you see that the COLLEGIUM MUSICUM or the CAMERATA SINGERS performing again – GO THERE and be moved to such an extent that you will not want it to finish. Truly one of the most enjoyable musical experiences of my 82 years! The Christmas concert given by the choir and orchestra of the Collegium Musicum costa del sol under the ebullient direction of Annemarie Phililips, their long standing conductor, was a triumph achieved through, what must have been, many, many hours of rehearsal. 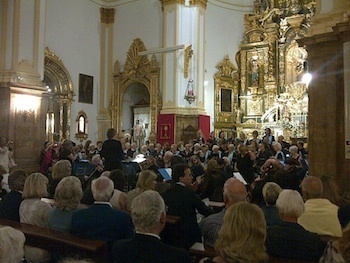 The second of the two performances given by the Collegium was at the Iglesia de la Encarnacion In Marbella, and it was packed to the gunnels with a very appreciative audience. They were to witness a memorable program of works by Bach, Handel, and, I was delighted to learn of the inclusion of works by Karl Jenkins, the most performed living composer of our time. The wonderful soprano voice of Hungarian Alinka Kozari who sang in the last December concert, and the principle trumpeter from the Malaga Philharmonic, Angel T. San Bartolome were the featured soloists. Of the three pieces by Karl Jenkins, the Adiemus 1. demonstrated his complete understanding of what beauty the human voice can produce, and the choir should be very very proud in their achievement of portraying this. This is a very beautiful English song site. Where you can down load song.